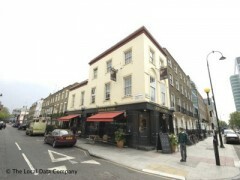 About: Crown & Anchor is a friendly pub that serves a variety of beer and English food. Seating on the terrace is provided, weather permitting. They also show Sky Sports. Awful pub - really nice setting but the service is truely terrible and the staff extremely rude, they all have serious attitude problems. I thought of popping into one of Drummond Street's many Indian restaurants and opted instead to have a meal in the Crown & Anchor. I ordered Haddock and Chips only to find the fish tasted of nothing, and I mean, nothing at all - totally without flavour. I complained to the staff and they seemed bemused and not inclined to do anything abou it. I asked them to take it to the chef and ask his opinion, and although they said they would, they didn't bother. Finally I persuaded them to contact the chef and ask him about the fish and his response was that "the man who brings the fish brings the same fish every day." Make of this what you will, but it seems clear to me that the chef cares nothing for food and clearly isn't interested in customer feedback either. I left hungry and down a few quid lighter.